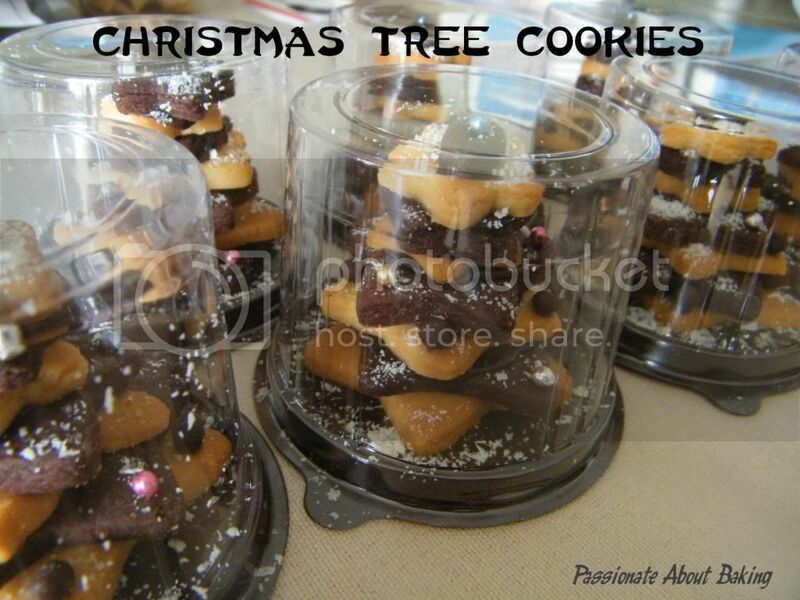 Here's sharing a Christmas Tree Cookies with you. I adapted the recipe for the cut out cookies from Martha Stewart's Citrus Cookie Dough and the Chocolate Cookie Dough. Chill it, and roll it out in a floured surface. The cookie dough can be quite soft at times, I had to rub in more flour. Using star cookie cutter of various sizes, cut out according to your preference. Bake it at 190C for 15-18mins depending on the size of the cookies. Place the same size cookie doughs together. Do not mix various sizes as the cooking time is different. Alternate the cookies from biggest (at the bottom) to the smallest (at the top) with citrus and the chocolate. 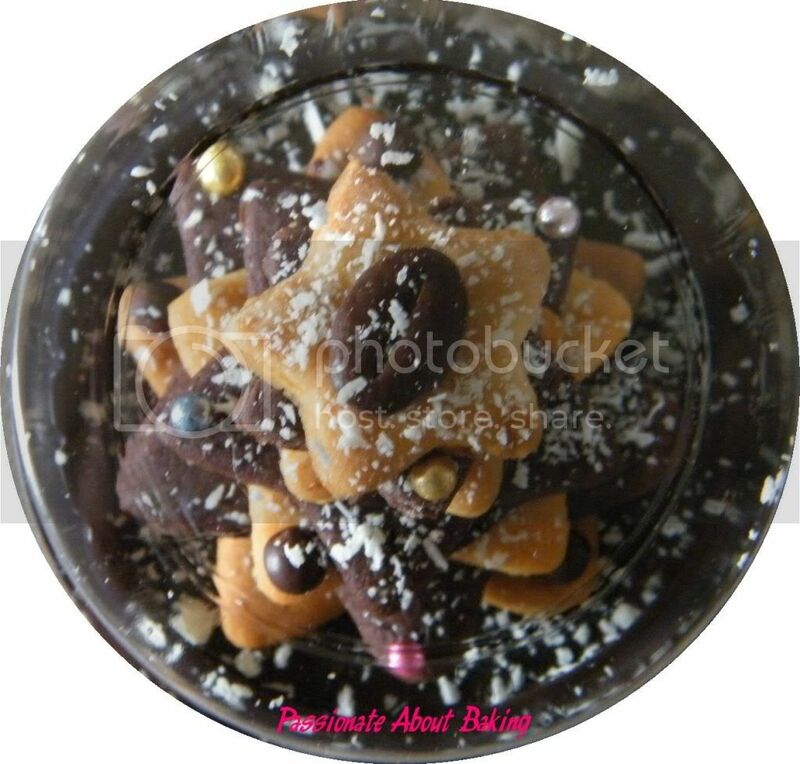 Put some chocolate ganache on the cupcake base and place the biggest star cookie on it to stabilise it. 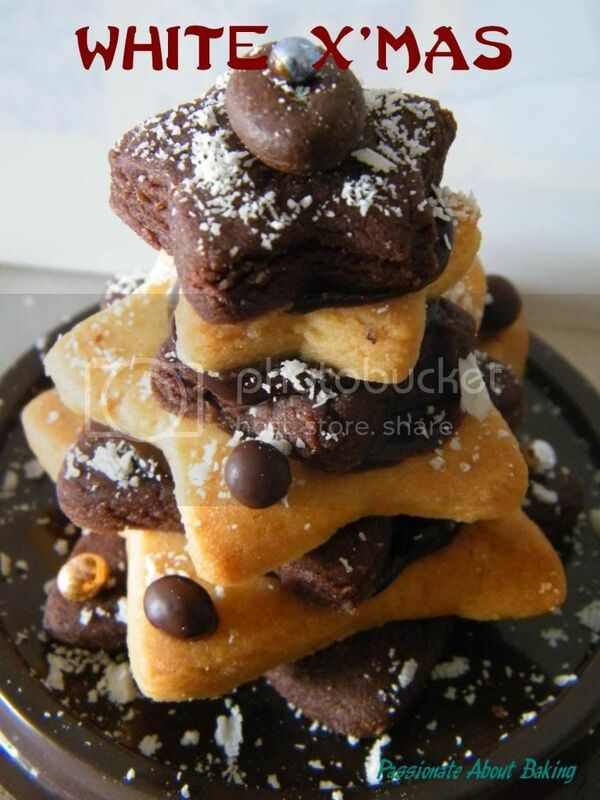 Sandwich the cookies together using chocolate ganache. I used dark chocolate ganache. You may use white chocolate. Alternating the colour dragees and chocolate pearls on the tip of the stars. Topped the last star with chocolate coffee beans (or any other toppers you can find). Lastly, sprinkle white chocolate shavings on the X'mas tree cookies. Wrapped it up, and give it away! 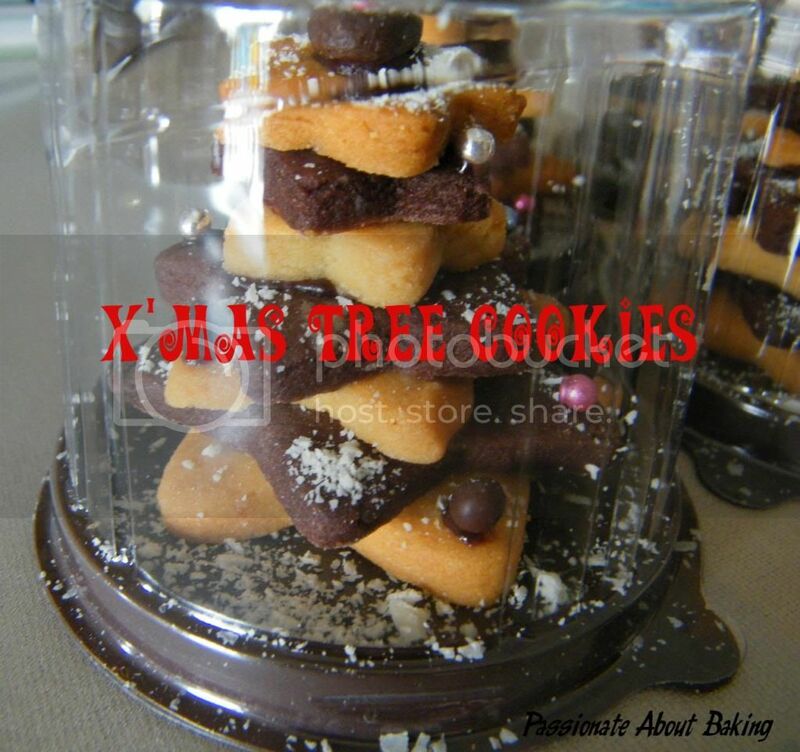 You can use any cut out cookie recipe to create the X'mas Tree. I'm limited by the size of my cupcake plastic container. Your X'mas tree can be as high as you like. Toppers can be anything, including a vertical star. The design and creation is unlimited, be creative! I'm submitting this to Aspiring Bakers #14: Creative Christmas Bakes (Dec 2011) hosted by Hankerie. Thank you to those who put in their comments, and their congratulation notes to me. Congratulations Khim! I shall email you and see how we can meet up for me to pass the vanilla extract to you. I hope you will like it! Since I started blogging three and a half years ago, I have made many friends, learn more about baking and cooking, and formed genuine friendships. I started the blog to record my baking (and cooking) journey. I didn't think it would last that long. However, when readers and bloggers started leaving comments in my blog, I was more encouraged. Even though my blog is not popular, I'm not disheartened. I'm happy as it is. 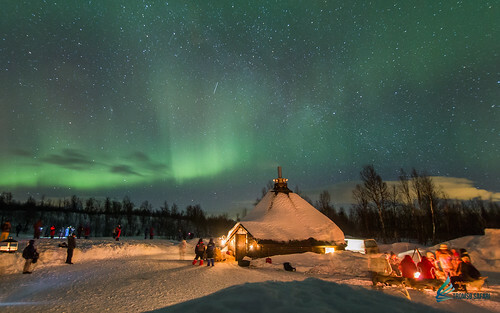 I know my objectives of being here, and I'm contented that I'm able to share my experience with others! To celebrate my 600th post (YAY), I'm giving away my homemade vanilla extract (double YAY!!) Those of you who have made their own vanilla extract will definitely agree with me that after using it, you'll NEVER use any vanilla essence again, NEVER! 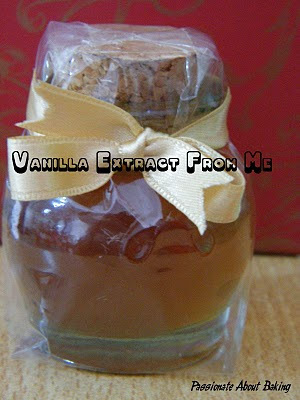 Homemade vanilla extract can be kept for a long time, aging it made it even more intense too! This is how you can get yourself a chance to win this homemade vanilla extract (approx. 20ml). Leave a comment and your email address in my post and tell me how do you intend to use it if you win. Only one chance per person regardless of entries. I'll use a random number organiser to pick the winner. Closing date for the comments : 9 December 2011. Applicable for Singapore residents only. Once again, thank you very much, my friends, my blogger friends and my readers, for your past support and encouragement. Passionate About Baking is very happy to share more baking and cooking experience with you! 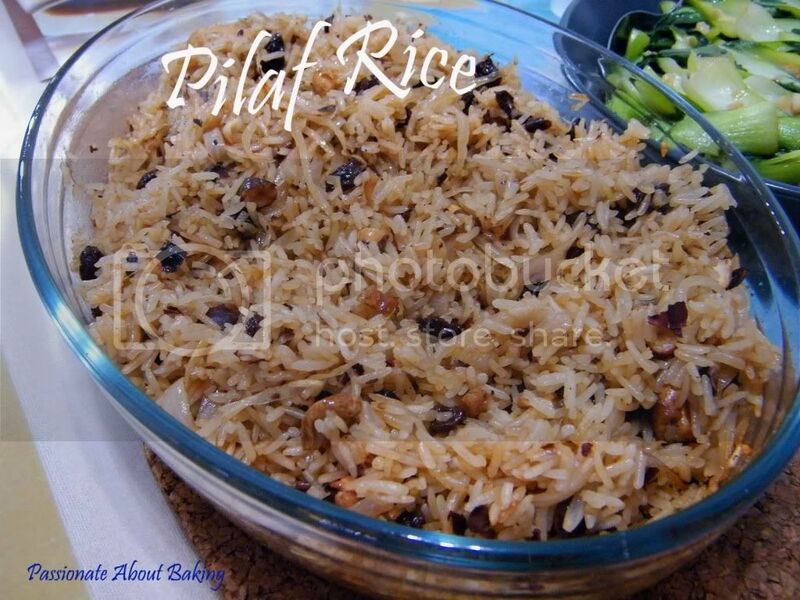 There are many variations of pilaf rice, some cooked in the wok, some cooked in rice cooker, while others baked them. Wanting to try out something new with rice, I decided to cook mine in the oven. 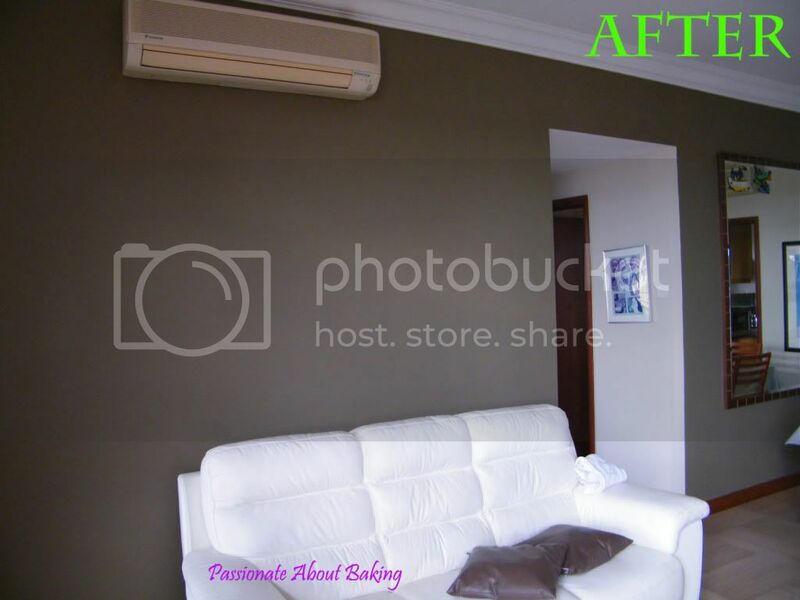 It was one of those rare days when my house was in a total mess due to re-painting works. My helper was busy clearing, cleaning and packing the stuff. So as a good employer (ahem!) I decided to prepare dinner instead. 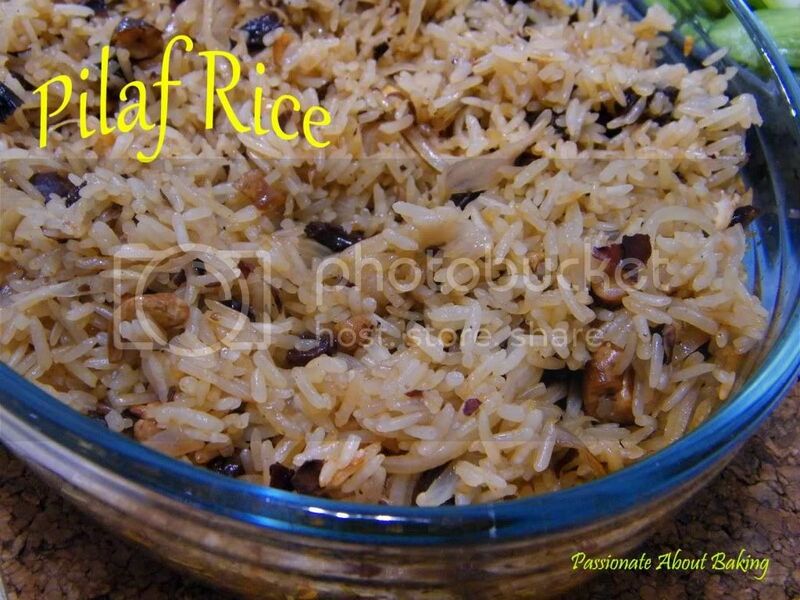 And so, I decided to make Pilaf Rice. Unfortunately, I didn't stir them to the right stage and some of the rice was not totally cooked. Fortunately, the taste was not too bad. No complaints received from the diners though. I shall try it again, it's not too difficult and the mixture of the nuts and raisins gave it a good mix of texture! In a large saucepan, put in the olive oil over moderate heat. When the oil is hot, add the chopped onion, mix well. Add in salt, pepper and paprika and stir well. Add in the rice all at once and stir continuously until the rice turned translucent. That will take about 5 minutes or more. Then transfer them to a baking dish. Add chicken stock in one go and mix thoroughly. Add in the cashew nuts and raisins on top. Cover with a lid or aluminium foil, and put into the preheat oven of 190C for 30 minutes or until cooked. Serve hot with vegetables or fish or meat of your choice. 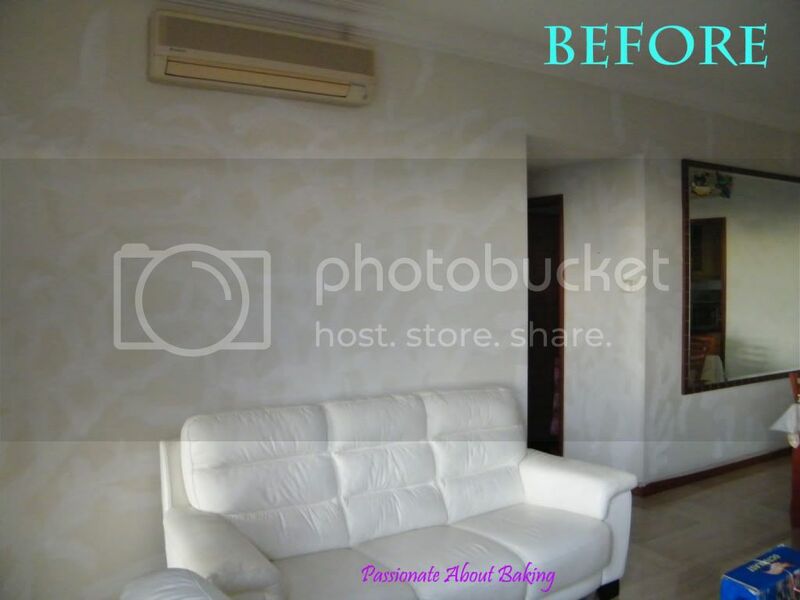 Before I end, here's the before and after of my living room. Zhuoyuan initiated this gathering and I wasted no time in agreeing. Very often, we view and comment on each other's posts, share ideas or opinions offline, but seldom get a chance to meet up. Therefore, this is a good opportunity to meet my blogger friends and catch up on the bakes and buys and what's nots! This time round, Eelin was our wonderful host. It seemed like with each gathering, the standard gets higher and higher! It was a brilliant idea to tag our foods so that we don't have to repeat ourselves to everyone else! And better still, I don't have to tag them in my blog post too! In such a conducive environment, with wonderful homemade foods and great company, I was totally relaxed and stuffed. Thanks again to my blogger friends for a wonderful afternoon! Here comes the buffet spread. Beautiful lunch set up, like a real buffet table. I've made chocolate cupcakes at least twice this month. Since I didn't have a chance to frost it, I've decided not to post them up. My sister loves her cupcakes to be frosted with buttercreams. 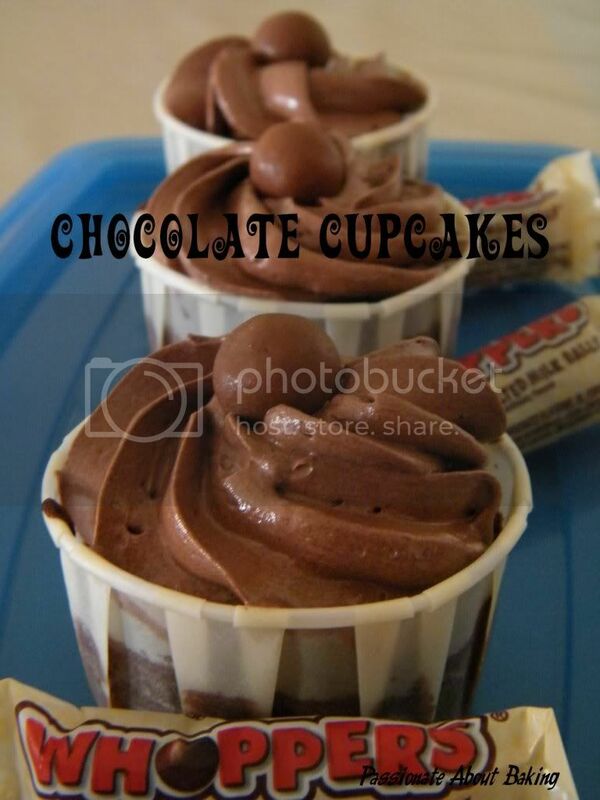 Therefore, to make her happy, I finally have the time to make frosted cupcakes for her. It was her favourite - chocolate cupcakes with chocolate swiss meringue buttercream. 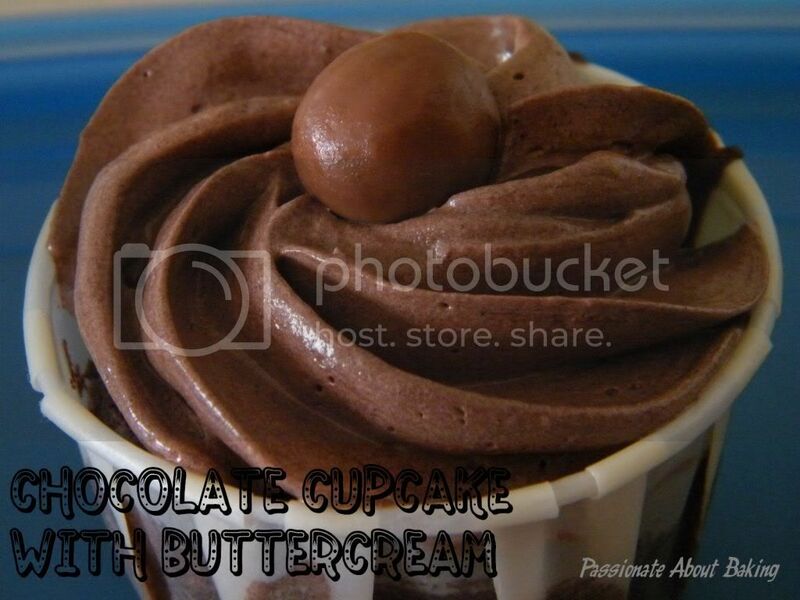 Recipe for Chocolate Cupcakes with Chocolate Swiss Meringue Buttercream. Cupcake recipe modified from "Rose's Heavenly Cakes". In a medium bowl, whisk the cocoa and boiling water until smooth. Let it cook to room temperature, about 30mins. In a small bowl, whisk the eggs, milk and the vanilla just until lightly combined. In the bowl of a stand mixer fitted with the flat beater, mix the sifted flour, baking powder, baking soda, sugar and salt on low speed for 30 secs. Add the butter and chocolate mixture and mix on low speed until the dry ingredients are moistened. Raise the speed to medium and beat for 1 1/2 mins. Scape down the sides of the bowl regularly. Starting on medium low speed, gradually add the egg mixture in two parts, beating on medium speed for 30 secs after each addition to incorporate the ingredients and strengthen the structure. Scoop the batter into the prepared paper cupcakes. 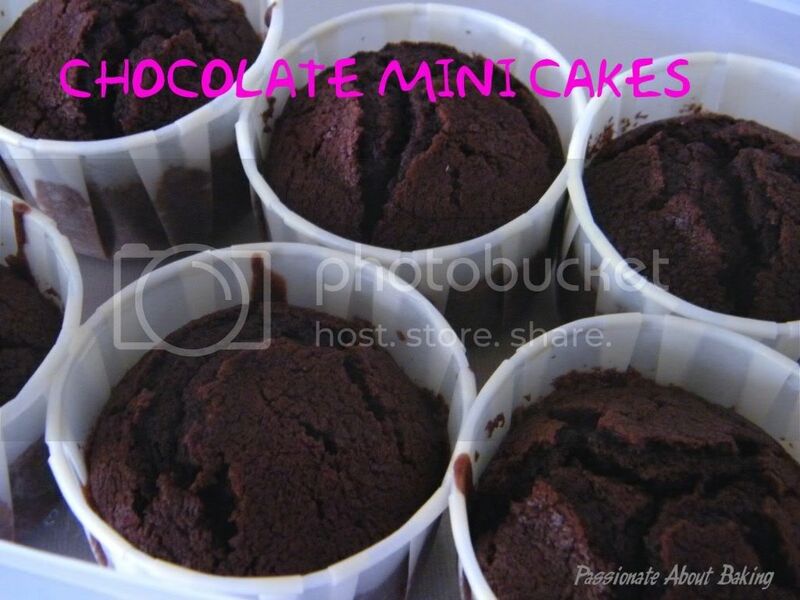 Bake in a preheated oven of 180C for 15 mins or until a skewer inserted in the centre of the cake comes out clean. 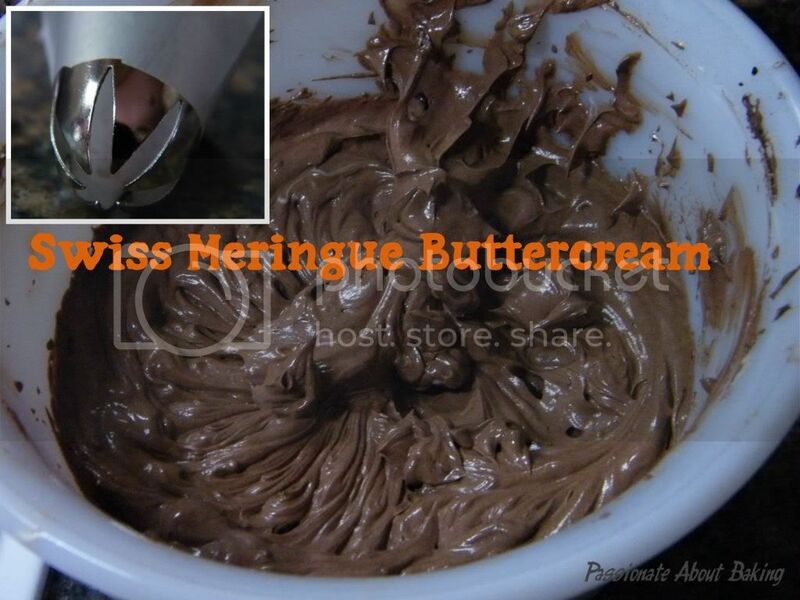 Chocolate Swiss Meringue Buttercream, modified from Batter Baker and Baking Library. Whisk the egg whites and sugar over a double boiler until sugar has dissolved. Remove from heat and whisk continuously until it's cooled and the peaks are stiff and glossy. Add the butter in 3 batches, ensuring that it is well incorporated before adding another batch. Continue beating until it becomes creamy and fluffy. Lastly, sift in the cocoa powder and continue beating until the buttercream is uniformly smooth and chocky. 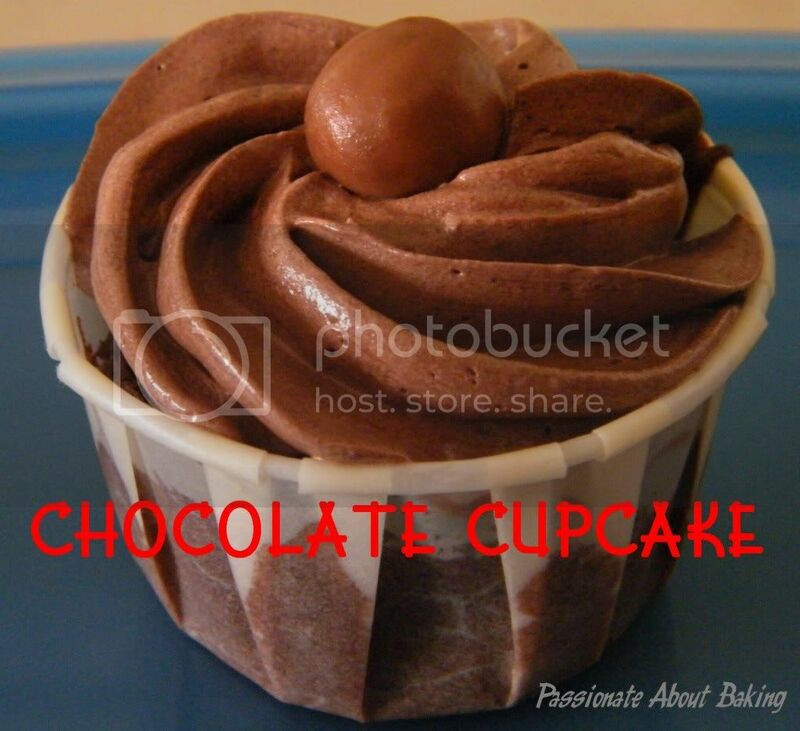 Pipe the buttercream on the cooled cupcake and topped it with Chocolate Maltese balls. I'm submitting this to Aspiring Bakers #13 - Enjoy Cupcakes! (November 2011) hosted by Min of Min's blog. 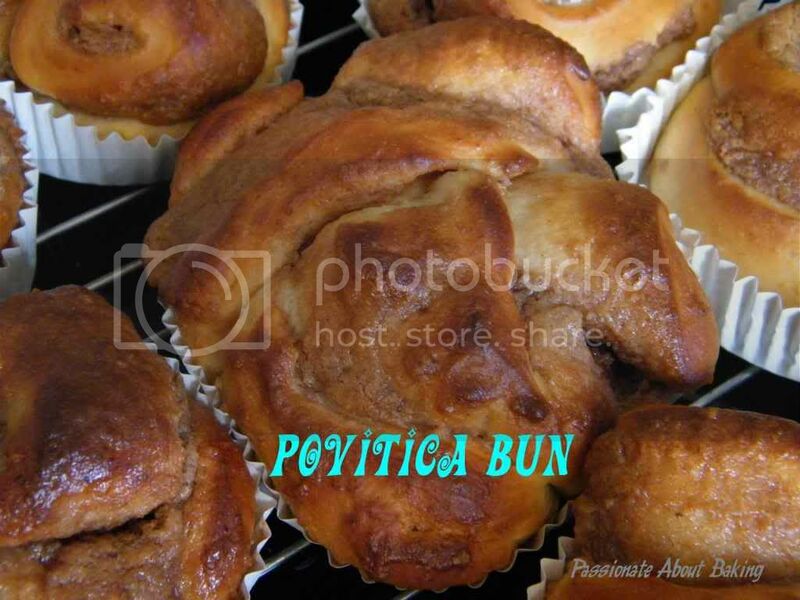 "The povitica, a traditional Croatian and Slovenian pastry, is made from buttery pastry dough rolled into very thin layers and covered with a layer of brown sugar, spices, and walnuts." Doesn't that sounds nice? 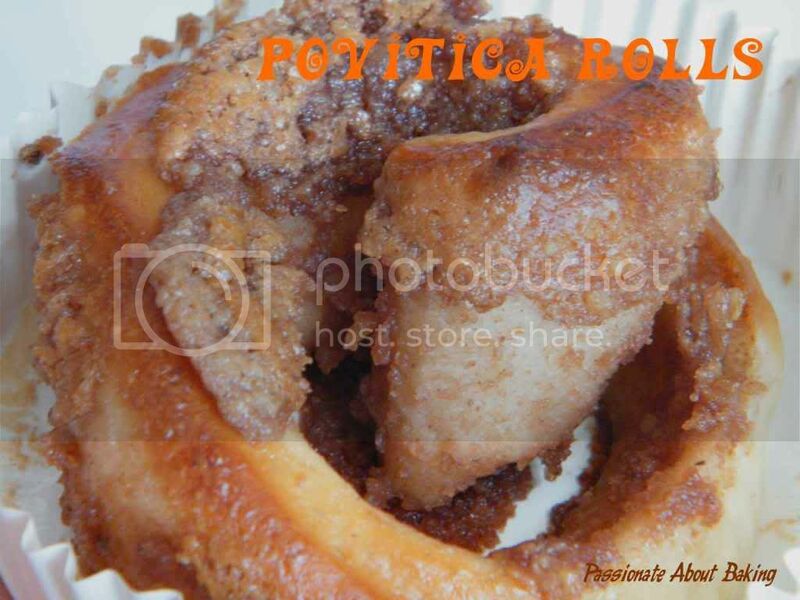 When I looked at the recipe, the ingredients looked very similar for cinnamon rolls too! I don't mind having cinnamon rolls everyday! However, what I did differently was that I didn't baked it as a loaf, even though I would like to. I divided the dough and baked them separately as buns to giveaway. The buns turned out to be soft and delicious. The ground walnuts dominated the paste. It will be better if more cinnamon powder or chocolate powder were added to enhance the flavour. The sweetness was just right for me. The paste really compliment the softness of the bread well. 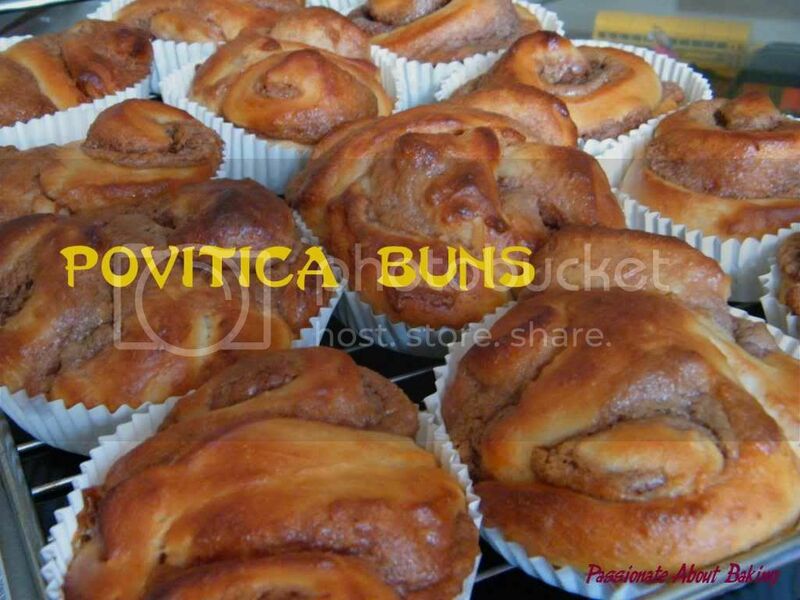 I will definitely try this again... Next time, I'll bake them in loaves as I would love to see the swirls they create! 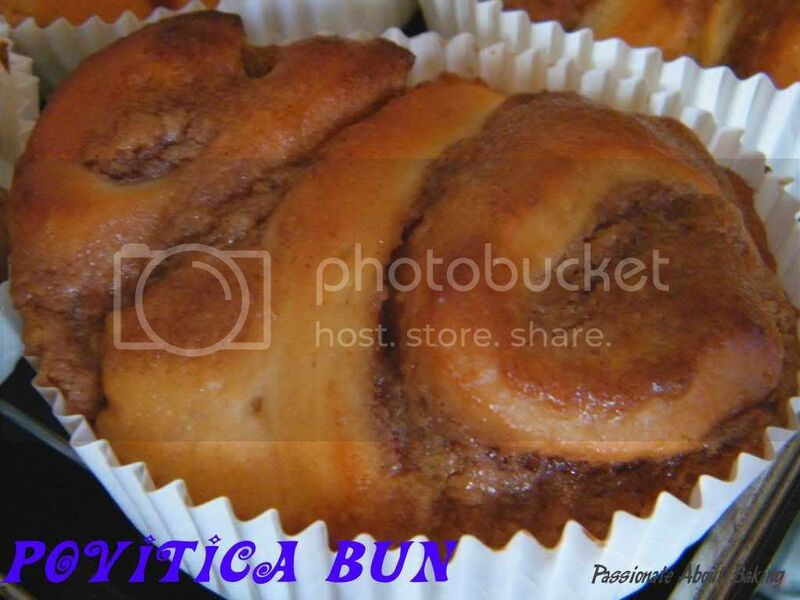 Recipe for Povitica, modified slightly from Wilde in the Kitchen. In a small bowl, mix together the (A) ingredients and allow to sit at room temperature for at least 5 minutes. Make sure that your mixture is frothy. In a large bowl, mix warm milk from #2 above, sugar and salt from (B) until dissolved. Add egg, yeast mixture, melted butter and 1/2 cup flour. Add the remaining flour, 1/4 cup at a time, until the dough comes together. Use a k-beater to do the mixing. Switch to the dough hook, and knead until smooth. Coat a bowl with cooking oil and add dough, roll the dough around to coat in oil. Cover the bowl with plastic wrap and allow to rise for an hour, or until doubled in size. Just before the dough is doubled, grind the walnuts from (C) in a food processor and add the remaining ingredients. Mix all the ingredients from C together. You'll get a thick but spreadable mixture. Spread flour on your worktop. Add the bread dough, and divide into two portions. Let it rest for 10mins. On a floured surface, roll out the dough thinly into a rectangular shape. Add the prepared topping and spread it thoroughly to cover the entire dough. Then gently lift up the dough and rolled it tightly towards you. Do the same for the other dough. Let it proof for another 45mins. Don't ask me how I got those patterns. They were the result of the messy twists and turns! 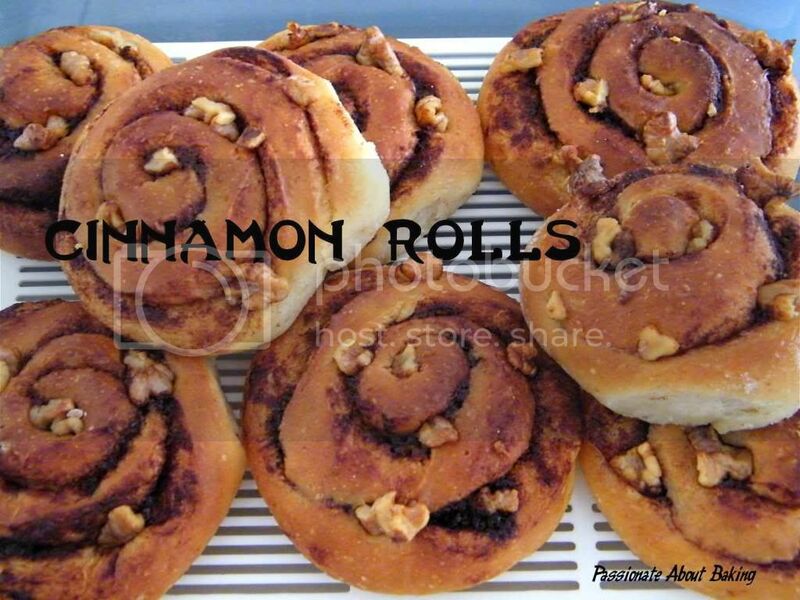 Over the past few weeks, I've seen so many bloggers baking the no-knead cinnamon rolls. It really tempted me to try this. There were so many good reviews about this recipe and the rolls. 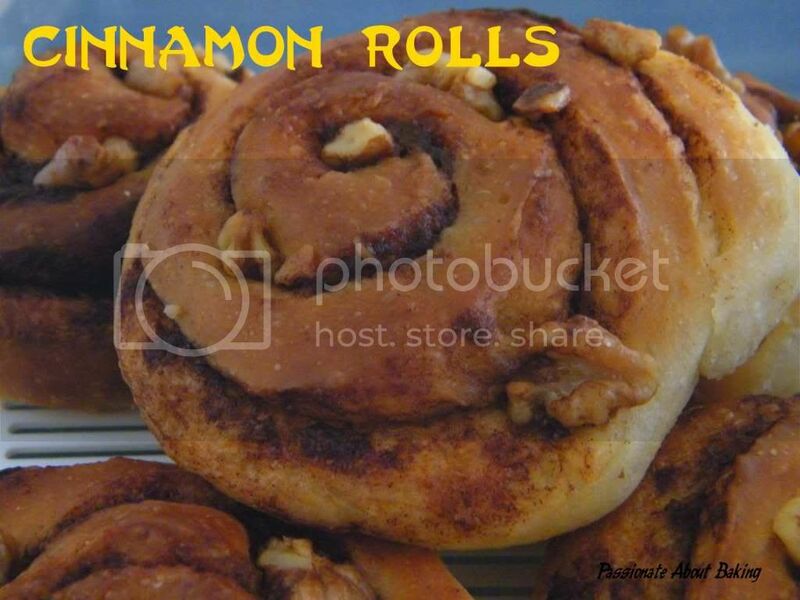 Being a cinnamon roll lover, I attempted this recipe. Even though the rolls turned out to be really soft and good, the handling of the dough was rather messy. I also thought it wasn't easy to add walnuts to it. I love my cinnamon rolls loaded with walnuts too! Therefore, I squeezed some miserable walnut bits to the rolled dough. Quite unsightly uneven as you can see. 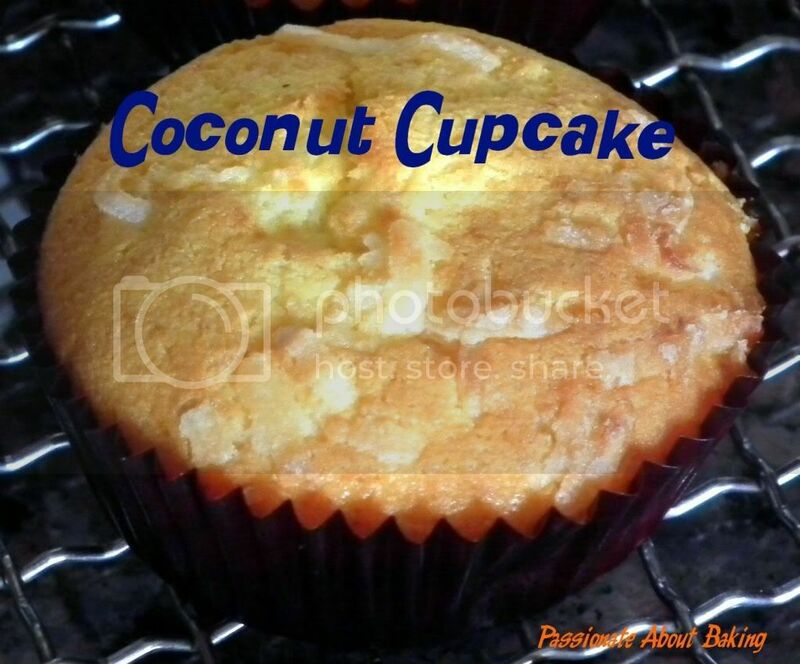 I have been wanting to bake this coconut cupcakes for the longest time! I have bought the coconut powder and left it in the cupboard...awaiting to use it. The right time came when my sister gave me some organic coconut oil. I thought using coconut oil to bake coconut cupcakes will truly enhance the coconut taste. 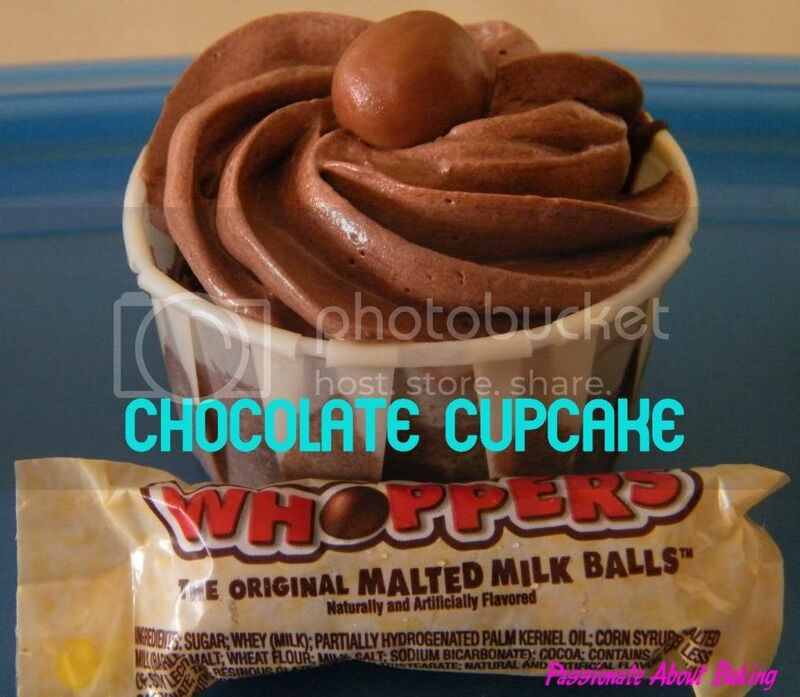 This cupcake truly lives up to its name! It was very soft and moist. The coconut oil did bring out the fragrant coconut smell and it was really nice, especially when it was warm! The sweetness was just perfect! 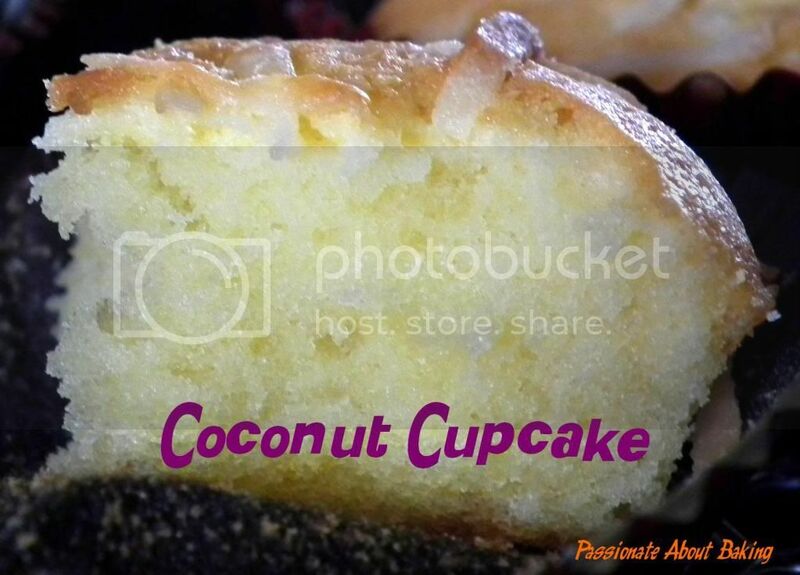 Coconut lovers must really try this cupcake, I'm sure you will be sold! 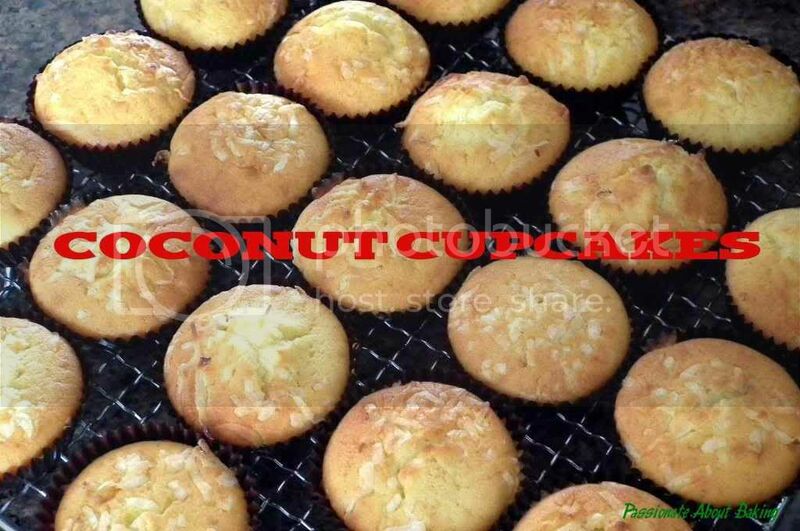 Recipe for Coconut Cupcakes, modified from Bakericious. 1. Using a whisk, beat butter and sugar until light and fluffy. 2. Add in egg, one at a time, beating thoroughly after each addition. 4. Add in milk and mix well. Add in coconut oil and incorporate. 5. Add in sifted flour and coconut powder, mix well. 6. 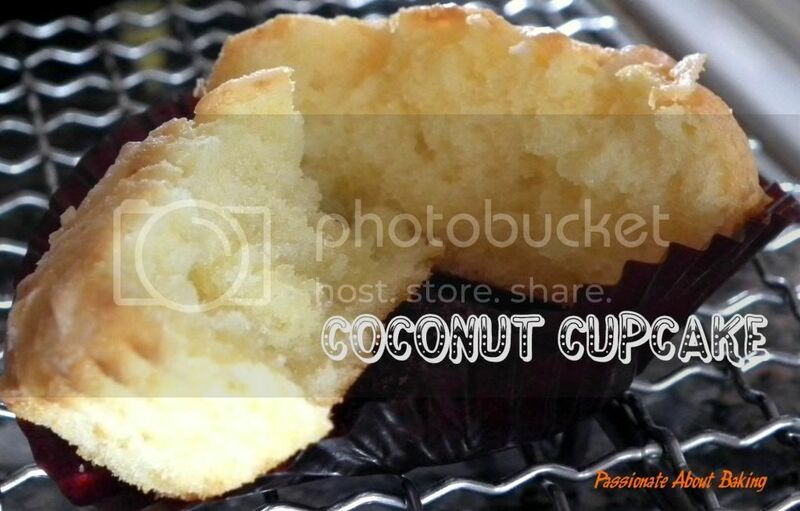 Scope the batter into the cupcake case, topped with some coconut flakes on top. 7. Bake in pre-heated oven at 190C for 15 mins. After note: I realised that the coconut taste wasn't too prominent after one day. 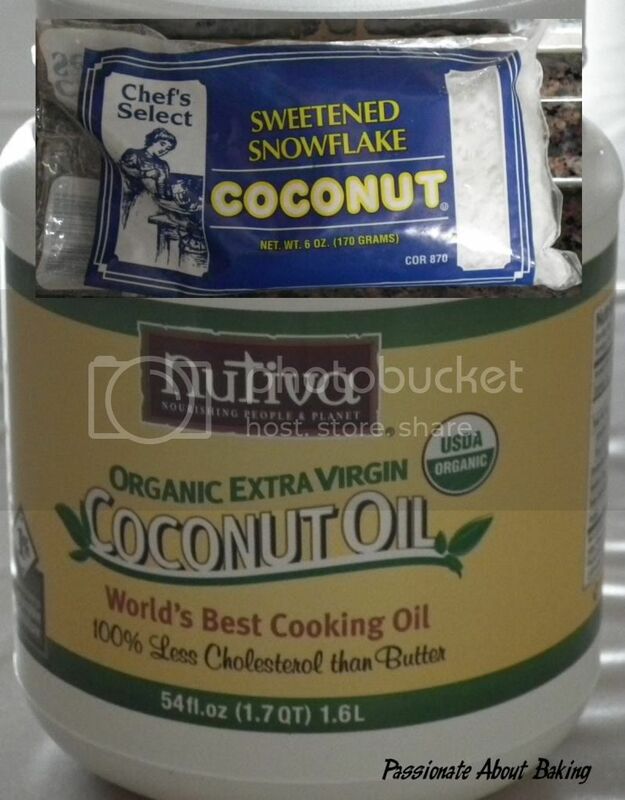 I will add more coconut oil and upped the coconut powder to the original 100g to give it more omph! However, the cupcake did have a very fragrant buttery taste. [Backdated to early Sep.] During one of my off days, I decided to make pizza for our dinner. 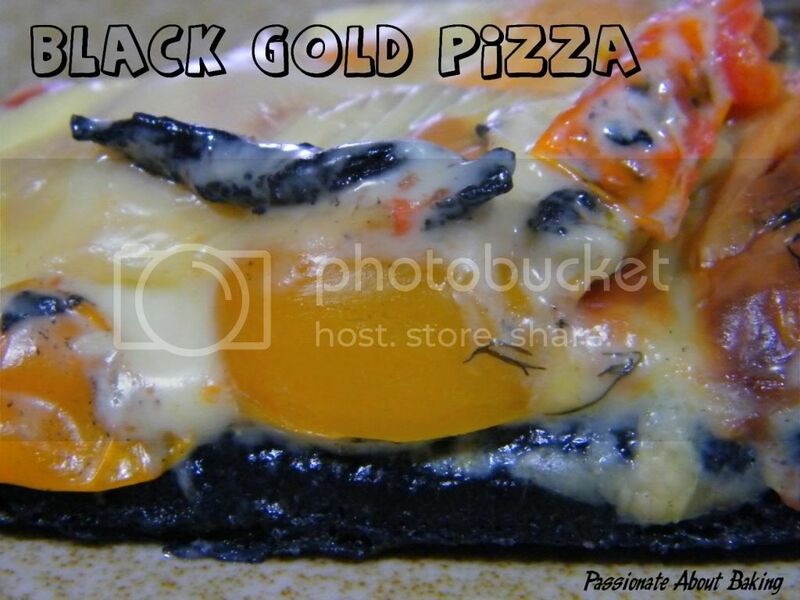 Wanting to make something special, I tried the black gold pizza from "Pockets of Happiness" by Chef Judy, owner of Creative Culinaire. The pizza turns out to be soft and nice. 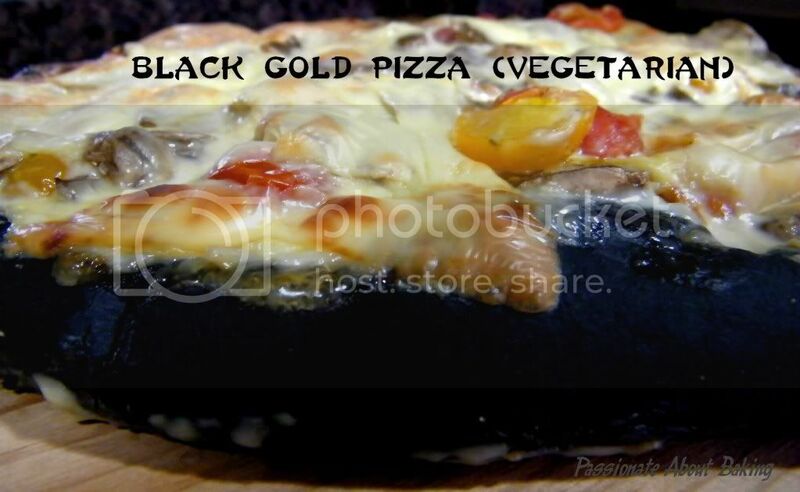 There was a slight hint of charcoal taste on the palate after eating. Nice for a change. 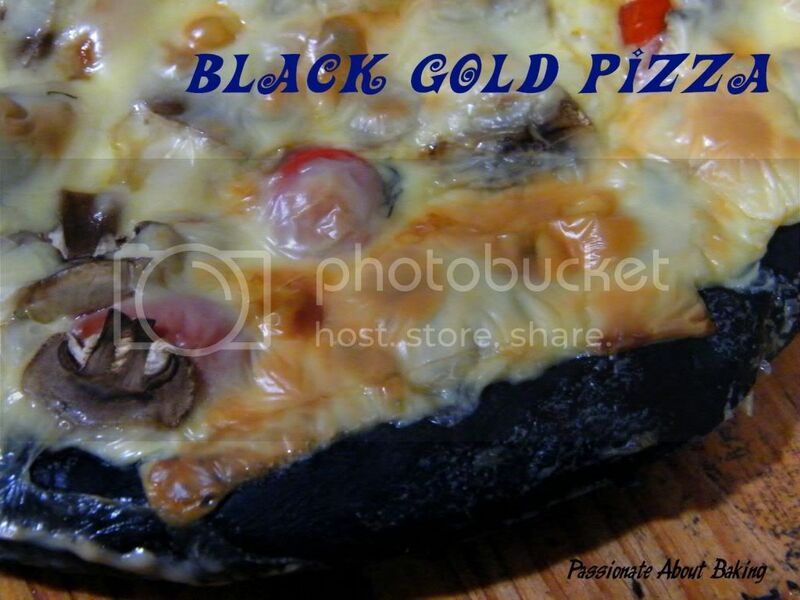 Recipe for Black Gold Pizzas, modified from "Pockets of Happiness" by Judy Koh. Knead all the ingredients for the dough together in a mixer till a smooth and developed dough is formed. Round the dough, cover and allow it to ferment for about 1 hour before punching the dough down and stretching it to fit into a 9" pizza pan. Brush the surface with olive oil, spread the mayonnaise on it and arrange the cheese, tomatoes and mushrooms nicely. Topped them up with the remaining cheese. Proof for another 15mins before baking in a preheated oven at 200C for about 15mins or until cooked. Final leg of our trip was New York City (NYC). Half of our NY trip was spent in this beautiful city. Even though it has rows and rows of buildings, each building has its own unique structure. The city has a mixture of new and old buildings too! At every turn of a corner, there seems to have a construction going on. It seems that the city is never free from constructions! We spent most of the time going for sight-seeing. There were just too many places, but too little time. Commuting from one place to another wasn't difficult at all! New Yorkers are generally quite friendly. Even though I didn't have a physical map with me, I was able to move from one place to another by asking directions. The Metro subway lines can be very confusing, but very comprehensive and convenient. On the last day when my spouse was supposed to take a domestic flight for his business trip, he took the wrong train and missed his flight! When you're in New York City, don't forget to book a day trip to Woodbury Premium Outlet where they sell premium brands at a discount. Brands like Kate Spade, Coach, Kenneth Cole, Nike, Nine West, Osh Gosh etc are good American brand buys. Actually, one full day for us wasn't enough! I covered barely 50% of the shops! We stayed in Hampton Inn Madison Square. It was one of the cheaper accommodation I found in NYC. You know how expensive it is to live in cities like this. So you can expect the room to be very small, but comfortable. These were the places we covered - Empire State Observatory, Cruise to view Statue of Liberty, Rockefeller, Woodbury Premium Outlet, Charging Bull, 9/11 Memorial, Wall Street, Times Square and Grand Central Terminal. Of course, more shopping in Macy's and JC Penny. I would love to go back there again...some day. However, before I do, I'll have to be well prepared mentally and physically to go through at least 20hours of flight time and transit. NYPD cars around Times Square. Stand by for "Occupy Wall Street" march at Times Square.